When we arrive in Merzouga we’re greeted by our host who quickly serves us the omnipresent mint tea. We ditch out belongings and only take what we can carry on our backs. We’re going into the Saraha. A four wheel drive Toyota zooms at full speed toward the dunes. It’s dromedary time. I’m still not sure I understand the difference between a dromederm and a camel. After a harrowing twenty minute blitz we arrive out our point of debarkation. Five awkward camels await us lined up one after the other. 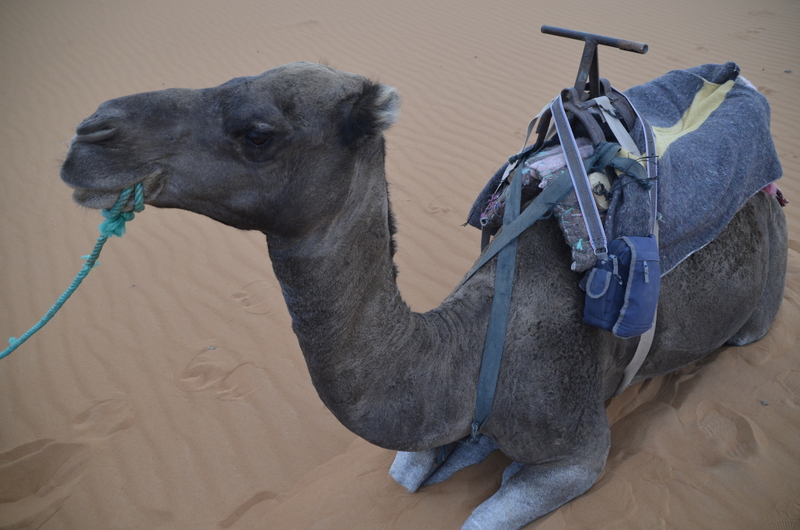 Each has a thick set of blankets on it’s hump held together with leather straps and saddle with a metal handle. 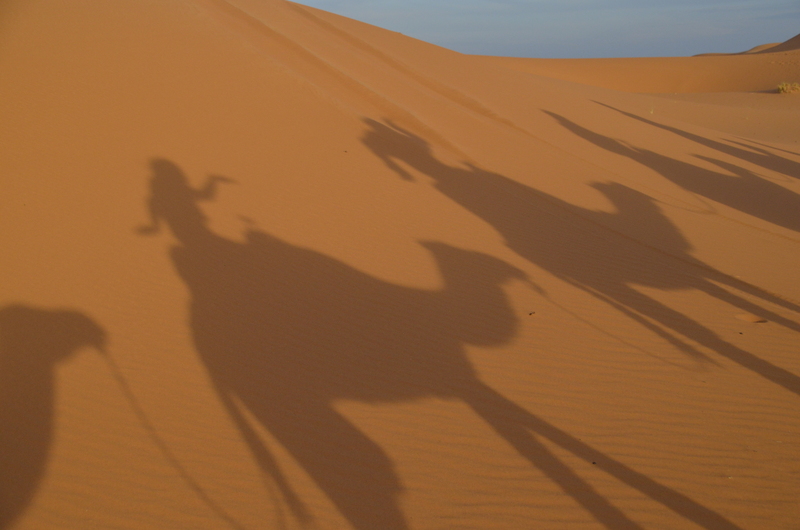 Once mounted your camel will rise unconfidently off the ground with their long gangly legs. As we being to wander into the desert a strange and timeless feeling passes through my mind. I’m completely transported through the ages. 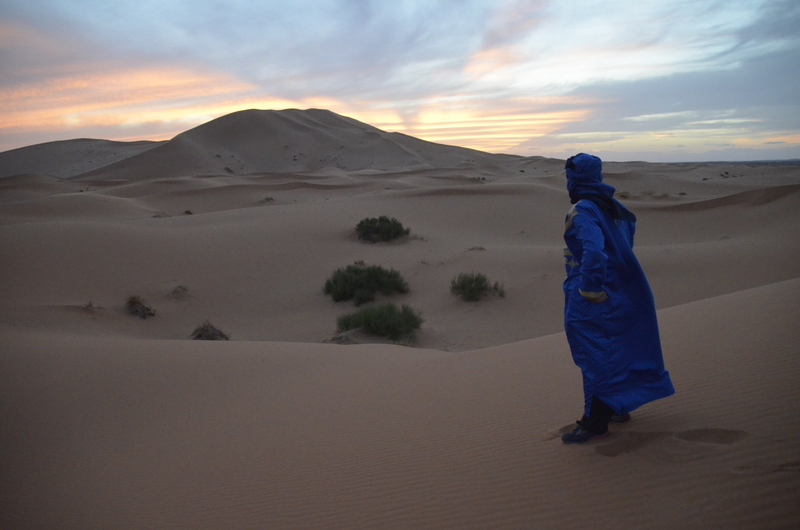 We slowly climb and descent over wider and longer dunes. I watch intensely as each camel moves across the landscape. Their feet slowly press down into the soft sand then strangely hold firm as they glide forward. At one point we pause to observe a few lonely dung beetles are pushing their wares across the warm sand. After about an hour and a half we dismount to watch the earth finish it’s daily rotation. In the distance is an enormous dune with a halo of pink, red and purple light beaming around it. If you can find a way in your life to observe an Arabian sunset make sure it ends up on your bucket list.